Our Abpromise guarantee covers the use of ab19027 in the following tested applications. WB Use a concentration of 1 - 4 µg/ml. 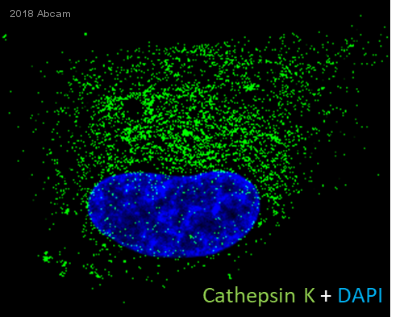 Detects a band of approximately 40, 29 kDa (predicted molecular weight: 37 kDa).Can be blocked with Cathepsin K peptide (ab41720). 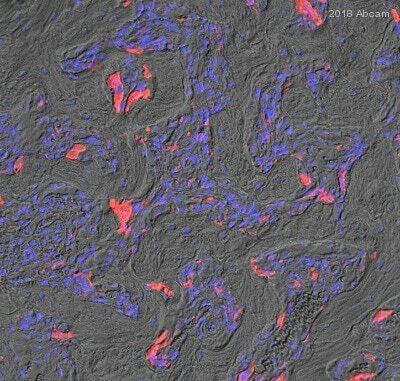 ab19027 staining Cathepsin K in mouse bone tissue section, in which human MDA-MB-231 Breast Cancer cells were grown, by Immunohistochemistry (Formalin/PFA-fixed paraffin-embedded sections). Tissue underwent paraformaldehyde fixation and then blocking with 10% Casein for 30 minutes at 22°C was performed. 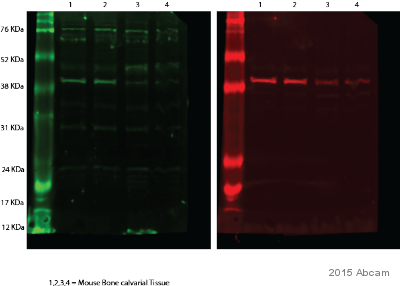 The primary antibody was diluted 1/200 and incubated with sample in 10% Casein for 17 hours at 4°C. 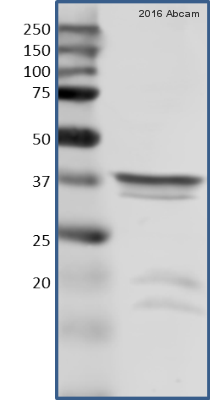 A Biotin conjugated goat polyclonal to rabbit IgG was used as secondary antibody at 1/200 dilution. 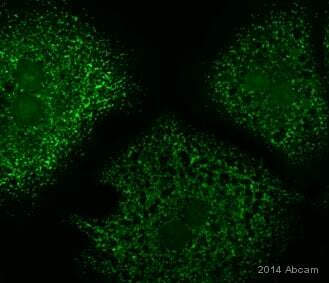 ab19027 staining Cathepsin K in the Human cell line HepaRG by ICC/IF (Immunocytochemistry/immunofluorescence). Cells were fixed with formaldehyde, permeabilized with Triton X-100 0.1% and blocked with 1% milk for 30 minutes at 21°C. Samples were incubated with primary antibody (1ug/ml in 1% milk) for 30 minutes. 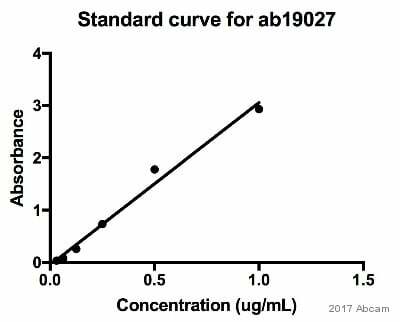 An Alexa Fluor®594-conjugated Goat anti-rabbit IgG polyclonal(1/400) was used as the secondary antibody. 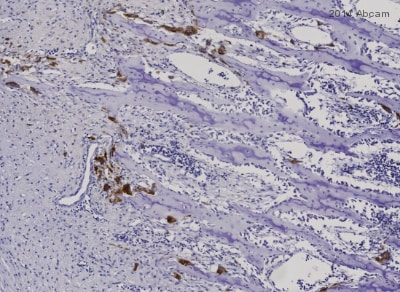 Immunohistochemistry (Frozen sections) - Anti-Cathepsin K antibody (ab19027)Image courtesy of an anonymous Abreview. 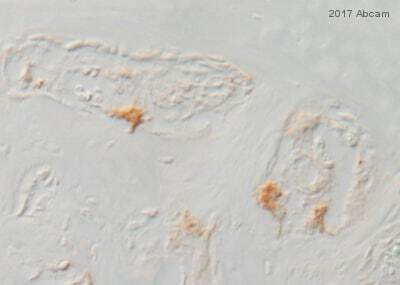 ab19027 staining Cathepsin K in rat osteoclasts by Immunohistochemistry (Frozen sections). 21 day old rat bone was fixed in methanol and then blocked using 20% serum for 30 minutes at 22°C. Samples were then incubated with primary antibody at 1/50 for 3 hours at 22°C. 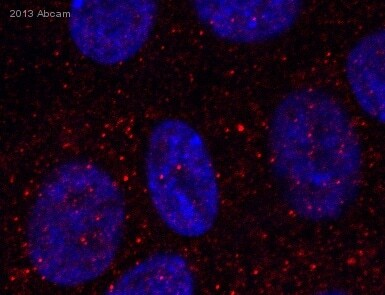 The secondary antibody used was an anti-rabbit IgG conjugated to Cy3® (red) used at a 1/1000 dilution. 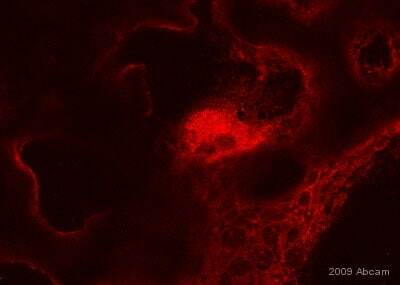 Immunocytochemistry/ Immunofluorescence - Anti-Cathepsin K antibody (ab19027)Image courtesy of an anonymous Abreview. 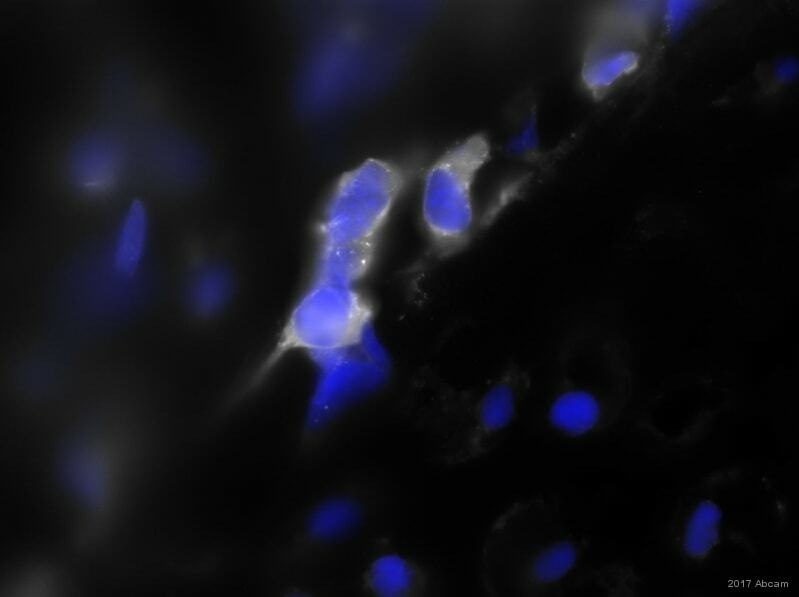 ab19027 staining Cathepsin K in cultured human osteoclasts by Immunocytochemistry/ Immunofluorescence. Cells were fixed in paraformaldehyde, permeabilized using 0.1% Triton X-100 PBS, blocked with 1% BSA for 1 hour at 25°C and then incubated with ab19027 at 2µg/ml for 30 minutes at 25°C. The secondary used was a FITC conjugated goat anti-rabbit polyclonal used at a 1/00 dilution.